My favorite how The Vampire Diaries is back tonight and not soon enough for me 🙂 On last week’s show appearing unexpectedly at Mystic Falls High, Rebekah wasted no time trying to force Stefan, Elena and Caroline to answer her questions about the search for a cure, leading to a bombshell piece of information from Elena, she loves Damon. When Bonnie’s father, Rudy Owens, accepted the role of Interim Mayor, he made it a priority to protect his daughter, who wasn’t at all comfortable with the role he suddenly wanted to play in her life. Professor Shane continued to encourage Bonnie to believe in her powers, but he soon found himself in danger when he revealed too much to the wrong person. 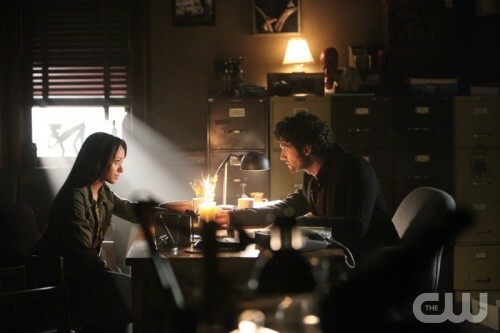 Later, Caroline did her best to comfort Tyler after a violent confrontation. Meanwhile, at the lake house, Damon and Matt trained Jeremy, trying to raise his game as a hunter, but Klaus was impatient with their progress and intervened to speed up the process. Did you see last week’s episode? We did and we recapped it here for you. On tonight’s show A NEW DANGER — Jeremy is furious when Klaus tries to control him by putting Matt’s life in danger. Damon coaches Jeremy as he prepares to take on Klaus’ new vampires, but they find that Kol (guest star Nathaniel Buzolic) has beaten them to it. Kol makes it clear that he will stop at nothing to convince everyone to give up the search for the cure. Looking for a new ally, Rebekah reminds Stefan that they were once close friends. When Sheriff Forbes and Mayor Hopkins (guest star Rick Worthy) question Shane (guest star David Alpay) about his involvement in the Founders’ Council deaths, Bonnie steps in with questions of her own, and Shane’s responses push Bonnie to the edge of her powers. Elena negotiates with Klaus to keep Jeremy safe, but when danger suddenly appears from a totally unexpected enemy, Elena comes up with her own daring plan for Jeremy. John Dahl directed the episode written by Brian Young & Michael Narducci. THE VAMPIRE DIARIES SEASON 4 EPISODE 11 LIVE RECAP HERE!